KIRMAN EUDORA BIS PUPPY - Kashmani uppfödning av salukis och shetland sheepdogs (shelties). Karin Hedberg. FCI internationell exteriördomare hundutställningar. 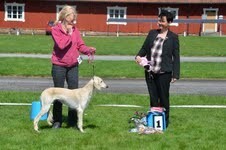 Eudora was BIS Puppy 6-9 months at the Saluki Club Show at Ljungbyhed Park on May 13, 2012 at exactly 7 months of age, awarded by breeder-judge Agneta Doverholt, Dahaqin Salukis.